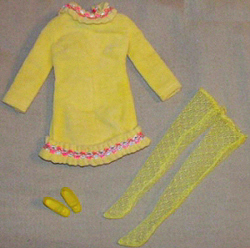 The pink braid trim is at the hem and forms a high collar on the long sleeve soft velour mini dress. This outfit can be harder to find - the yellow hose are especially difficult to come by. This simple shift style dress was very popular in the 1960s. I think one of the reasons for its popularity is that many women made their own clothes and this was an easier style to sew. The bright yellow velour is a good example of the early mod style - when things were starting to get wilder - but not all the way yet. Donovan's hit song "Yellow Mellow" was released in 1966.